I have had several feed units which I designed but after many years of use I abandoned the last one when the design needed comprehensive changes. Rather than ‘patch’ the old one it was time to see what other owners had made and so I eventually opted for a fine feed drive using a car windscreen wiper motor. The unit attaches to the LH end of the table and has a clutch lever to engage the drive or revert back to the conventional hand feed. The unit incorporates the following attributes: clutch engagement 12v motor drive selection of fast and slow speed (if on motor) switch to change direction variable speed limit switch on travel emergency stop The drawings are available in pdf format from this link. In use the feed provides adequate power for my needs and the resultant cutting surface is excellent. The table limit stops which can be set at any position when reached the unit automatically stops. The restart requires the clutch to be disengaged to move the table manually thus releasing the limit switch. In practice the limit switch is there just in case. The emergency stop button is far more convenient and saves using the clutch and can be reset as needed. I have never been keen on having a lot of soluble oil in the vicinity of the lathe slides mainly because it is an absolute pain to clean up and also despite my best efforts the water oil emulsion seems to cause rust or staining. 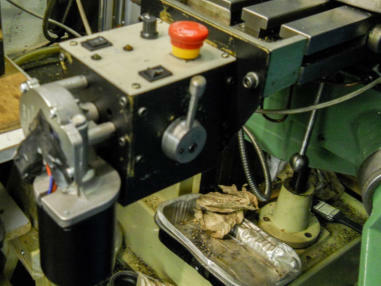 For my type of lathe work cooling oils are not needed as I am not in any hurry to take heavy cuts and the first sign of blue chips indicates the HSS cutting tool life is under attack. By contrast I do believe that soluble or light machine oils do help enormously to ‘lubricate’ the cutting edge and help release chips. There is also some small degree of cooling but the volume of oil I apply is very small unlike the flood units used in commercial machines. For years my usual practice has been to dab oil with a brush onto the work but this method has some serious drawbacks as it is potentially dangerous and means that one hand is handling a brush instead of the machine feed dials. The solution I wanted was a simple mechanism to provide a low volume soluble oil feed which could be varied in volume and applied only when needed and leave both hands free. The main need was for this device to provide soluble oil when parting off as this can be tricky if there is a build up of chips causing the tool to rub rather than cut. My parting off tool is a carbide insert which means the oil is there as a lubricant and not for cooling. Searching around for ideas the design was basically to gather together ready made bits from Ebay to make an assembly which provided: flexible feed hose for placement, variable feed supply, no drips, intermittent use and remote foot switch operation. The final unit cost very little but has proved to be very effective. Parts required: Flexible feed hose - multi link Pump - Babyfish AB12 6V DC Peristaltic Dosing Pump Speed control -SODIAL(R) 12V 24V 30V 120W PWM Adjustable Volt DC Motor Speed Controller CCM2 Unit Box Tubing - car washer tubing Attachment stand fitted to cross slide Supply container Transformer 6v dc Foot switch (micro switch) Design: The unit box fitted to the lathe back splash-back panel has the speed control inside and the pump assembled on the outside of the box lid so that the pump rotor is visible. 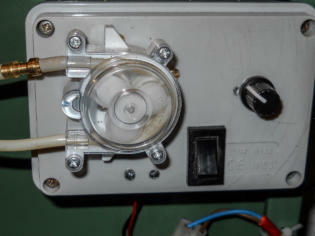 The box has a On/Off switch, ON LED, speed control dial, pump ON LED. The feed from the transformer enters the box to power the unit. A 5mm clear tube feeds from the pump outlet and up through the inside of the flexible feed hose to the outlet nozzle such that no leakage can exist in the flexible hose joints. The supply container is, in my case, a used medicine plastic bottle with a 5mm tube fastened to the base with the other end fitted to the pump inlet. 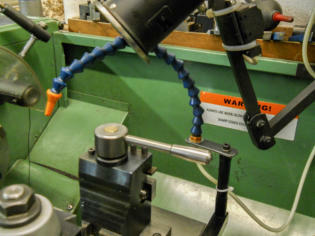 A stand is attached to the lathe cross slide to extend back and has a pillar to add height onto which the flexible feed hose is attached. Finally, a micro switch is used to make a foot operation switch which is basically a hinged plate mechanism. Operation: The power LED indicates that power from the transformer is available and when the foot switch hinge plate is pressed the micro switch provides power to the pump and the other LED illuminates. The flexible link feed hose can be placed in the required position and will hold that placement, with the supply tube fitted into the full length of the flexible hose ensuring no drips and leaks via the flexible joints! The pump motor when stopped will stop fluid movement and thus there are no drips.